WoPC Home > U.S.A. > Pyramid P.C.C. 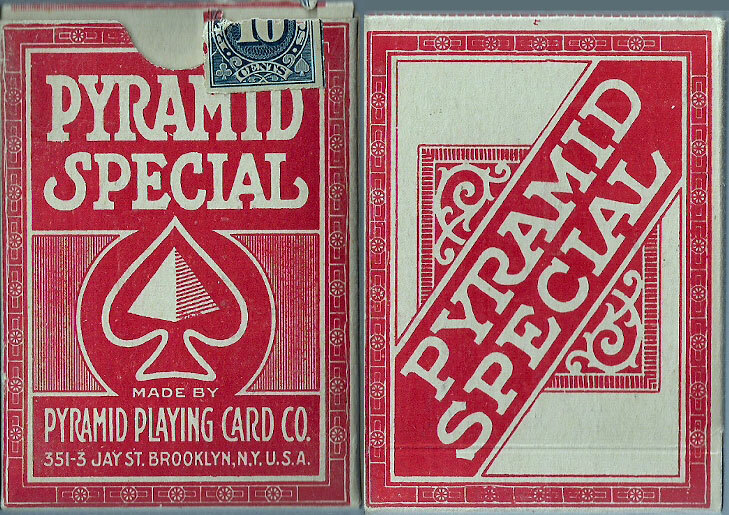 Pyramid Playing Card Company was founded in Brooklyn, New York, in 1920. They successfully introduced a number of standard brands (Winner, Pyramid Special, Mutual, Home Run, Iris, Peter Pan, Blue Nile, Blue Star, Princess, Umpire & Sunbeam) until the company was absorbed into U.S.P.C.C. and its affiliates, and finally dissolved in 1933. 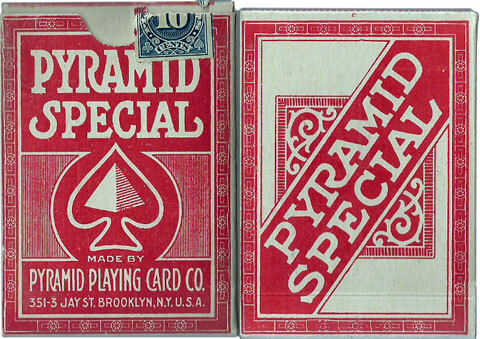 The imagery of pyramids and sphinxes on the Aces of Spades, Joker and boxes is believed to have stemmed from the fact that the original founders of the company may have had Egyptian origins. • See also: Kismet Temple, 1923.